Get ahead of the curve and join Agricology on farm for this fringe event to the Oxford Conferences. Driven by the need to build profitable farm businesses resilient to increasing uncertainties, many progressive farmers are opting to include restorative ley periods in the rotation. Their experiences show improvements to soil health, increased control of problem weeds such as blackgrass, reduced dependency on chemical inputs and positive impact on gross margins. 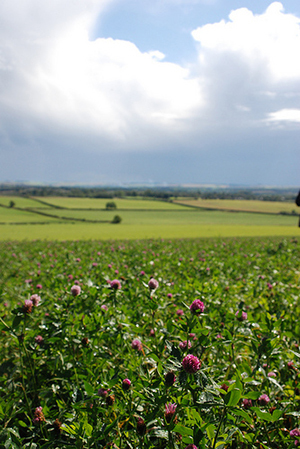 Reaping the multiple benefits of mixed farming to build sustainable systems for the future. There is no one size fits all and different farmers are choosing to do this in different ways – some are opting to reintegrate livestock in their farm business, some to collaborate with local livestock farmers and others to build in stockless fertility building periods. As a warm-up to the Oxford conferences, Agricology invites participants of the Oxford Farming Conference (OFC) and the Oxford Real Farming Conference (ORFC) and beyond (!) to join us on-farm to explore the role of restorative leys in different agricultural systems - regardless of labels. The tour around Daylesford’s beef, sheep, dairy, forage conservation and arable production system forms the backbone of discussion and a roving microphone will capture experiences of a range of farmers, questions from the group and supporting science from Agricology’s research partners. The event will focus on sharing experiences; exploring questions around species and breed selection, the benefits for soil health and weed control, crop utilisation and overcoming some of the challenges. Lunch will be provided. A coach will collect participants from Oxford at 9am and return back at 2.30pm to the OFC conference venue. Discussion can continue down the road to Oxford or over coffee at the Daylesford Organic Farmshop. @agricology and agricology.co.uk is a collaboration of over 20 of the UKs leading organisations working with sustainable agriculture (including Organic Research Centre, Allerton Education and Research Trust, Rothamsted, ADAS, RAU, DEFRA, Natural England, LEAF and Soil Association). We use practical, sustainable, farming information with profiled farmers and research to support a transition towards agro-ecology and more resource efficient, resilient and profitable agricultural systems.